When does the American Dream turn into a trap? What really gives meaning to our lives? Kelli Miller never had to worry about it – she had it all: a family, a career, a sprawling home, even an executive title. She thought she’d escaped her Midwestern roots and was sailing towards a golden future. Then, in a pivotal moment, confronted with the shadow of death, she found herself suddenly awake to the grim reality: the dream had consumed her life, and left her lost and alone. 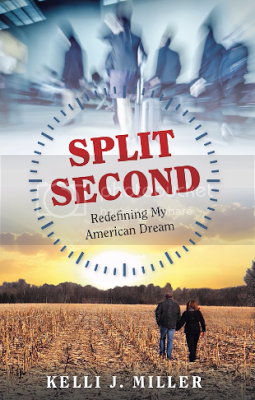 In Split Second, Kelli tells the story of how she set herself free, and recommitted herself to the most important pieces of her life: family, community, and a new openness to experience. It is the story of one woman’s journey to find out what really matters and where her happiness ultimately lay. Kelli Miller is a business executive specializing in Information Technology. Her career includes thirty years working for some of the largest, most successful companies in America. Kelli recently returned to her roots, farming her family’s farm with her husband, while continuing her technology career with a local mid-size manufacturing firm. Kelli is the mother of three. She loves to travel, hike and spend time in the simplicity and raw beauty of nature.